My blog readers realize I’ve been away from Poland since the first part of October. We left early in the month (October) in order to get back to the states for a missions conference which took place in the Atlanta, GA, area at a supporting church of ours. I least I think you do. I didn’t really announce when I left. When we were planning our trip, my sis and I were chatting and she said, “Why don’t you see if you can stay through a quilt show I’ve signed up to go to in November.” At first I told her it was impossible, but then, after talking it over with my husband, he agreed that it was okay for me to stay though it. He stayed about a week and a half after the conference and helped my mom almost nonstop at her place in Florida trying to control the jungle that seems to grow so easily down there. Then he came back to Poland for a couple of days and then headed on to the Ukraine to teach. And I stayed back in Florida. I helped out a lot in the store and organizing and doing labor for my sis. I tried to get some sewing done and even took pictures of the set up of sewing machine and such which I had there in Florida. But I was usually so tired by the time I came back to mom’s house in the evening that I couldn’t get excited about heading to the area where the sewing machine was. I suppose part of it was that it was not cool there and then there wasn’t really good lighting - okay for just living, but not quite enough lighting for what I was used to and wanted for sewing - especially after dark. So I made exactly three tops - and two of those three were panels that I simply added borders to. The other one was the simple snowballed 10” squares for the I Spy squares. But I didn’t get any of them finished. I packed them up and brought them back to Poland with me. At least I tried to bring them with me. As of my writing this post, my luggage has not yet arrived here. I had a tight connection between Tampa and Atlanta and my luggage didn’t make it. It is supposed to arrive today - in a few hours. Usually when I make a trip, I unpack the first day - trying to find homes for all the goodies that I bring back. Yesterday, because I had gate checked my luggage and paid for an extra bag, I didn’t have anything to unpack. It was strange! I landed with my personal bag (my purse). I didn’t have any problems at all coming back for which I’m thankful! My first leg was Tampa to Atlanta - an evening flight. The weather had been uncooperative for Atlanta and our flight was running late. Once I landed in Atlanta, however, I walked quickly to the international terminal, gate F1 - that’s the farthest one away from the “plane train” and made it before they finished boarding. This was an Atlanta-Amsterdam flight. My view on my way to Warsaw while sitting in our little City Hopper plane getting ready to push back. 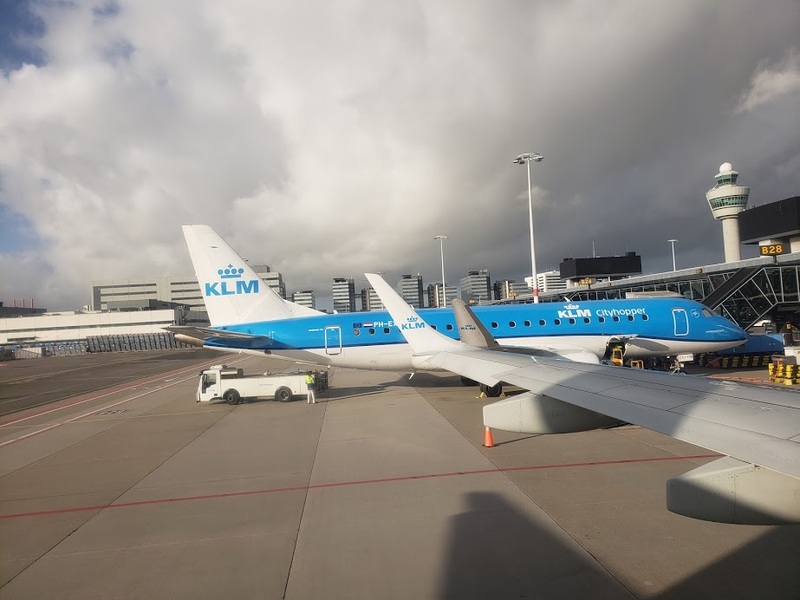 Then, once arriving in Amsterdam, I had plenty of time for my Warsaw flight. Not a lot of time, but enough. I was starting to wake up by this time, however. I didn’t really do much on the flight though- my eyes being too tired to try to play games or do anything - I just closed them and rested. While I had spent the night on the plane, it wasn’t particularly restful. None of my checked bags made it, however. While I was able to make my tight connection in Atlanta, my bags didn’t. KLM is easy to work with, though, and they gave me tracking information for my bags. I’m supposed to get them today (Wed.). I got them on Wed. afternoon just as they promised. Without a hitch. No problems. Everything came in as hoped and no bags were injured in the process. Here’s the Warsaw Chopin airport as I was walking out the door with my personal bag over my arm - and that was all. It felt strange having no luggage.. I went on outside and looked for my husband. And off we drove home! Thank you for introducing yourselves! I do so appreciate all of you who talked with me and said you read this blog. It was great! So many times I write and think that no one is reading. Well, not really “no one” as I already knew I have at least 5 or so readers!. I’d probably write even if I had 0 readers! :) It’s a great way for me to keep up with what I’m doing in my sewing life and gives me a chance to write cultural stuff that I can reference at any time when people ask. But it made it special to hear from some of you! Thanks! I’m still recovering. Jet lag for me coming this way takes usually about 5 -7 days. In just over a week, however, is Thanksgiving, so I’ll need to kick things in high gear. My husband told me we are going to have company over Thanksgiving weekend, however, so I’ve got to keep that in consideration for all I want to get done between now and then. I came back chomping at the bit to quilt and sew…as I really did miss it. I think I’ll prepare some backings for the rest of my upcycled blues quilts. I’m really ready to be completely done with that massive project but I still have a few more to quilt and my Hawaiian one to make. My first day back I went right into my stash room and just sat down and looked at it. I touched some of the fabric I have and thought about sewing. I think it’s crazy, isn’t it? I really did miss creating all that time I was in Florida! Spending all that time with fabric made me want to sew even more - but I had no energy left at the end of the day! The cats were glad to see me. They get along really well. The black and white one loves to groom the other one and the gray one gladly takes it. I let them sit on me and just groom for 20 minutes or so. I went in my upcycleds fabric and picked out some fabric to begin to make 3-4 backings so I can start to sandwich more of my upcycled blues series. I’m itching to get back to my 2” strips series - having taken almost the whole year off from them. My 2” strips are beginning to take back over again. I want to whittle them down. And now you know. For now, I’ve got a mess all over the dining room table - all my new acquisitions are sorted and stacked on the table! It’s just as fun to look at today as it was when I put them in the suitcase, though! And that’s what’s been happening in my quilting room today. Planning! Don’t forget to check out what my sis has for you over in the store!